In this memoir, MacArthur “Genius Grant” recipient Will Allen tells the inspiring true story of the Milwaukee urban farm he developed by cashing in his retirement fund. After a professional basketball career and success in the corporate world, he took on the challenge of addressing several issues in one fell swoop: the urban food desert, public health, racism, and unemployment. The Good Food Revolution: Growing Healthy Food, People, and Communities chronicles the first 18 years of developing his urban farm. Adult Services manager Stacey Peterson facilitates this book discussion. Participants are asked to read the book prior to the discussion. Registration is not required. Librarian Lee Blakley demonstrates how to make easy, natural, high-quality, shelf-stable soap, shampoo, lotion, deodorant, and moisturizer at a fraction of the cost you would pay for items of equal quality. Please register. Librarian Lee Blakley demonstrates how to make laundry detergent and softener, an all-purpose cleaner, glass cleaner, and more, at a fraction of the cost you would pay for ready-made natural—or unnatural—cleaners. Please register. Feed your family fruits and vegetables from your own garden. From site preparation through harvest, a Master Gardener from the University of Illinois Extension offers tips and tricks for successful gardening. Please register. Have you considered keeping chickens? Think of the advantages of having a fresh supply of organic, fresh eggs produced in your own yard. Local backyard chicken enthusiasts Jennifer Downing and Holly Kammes will tell you what is involved and how to get started. Please register. Beekeepers since 1971, Charles and Karen Lorence turned a summertime hobby into a thriving business. Today they manage forty-two hives in Wisconsin and Illinois and sell honey and beeswax products that have earned honors on the state and national level. Please register. 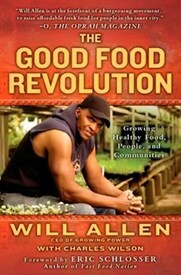 Batavia resident Jennifer Downing reviews The Good Food Revolution by Will Allen. Downing’s company, Nourish, provides cooking lessons, demonstrations, food-centric events, and private family food planning consultations. Registration is not required. Presenter Barbara Geiger discusses today’s green and sustainable movements including urban agriculture, green roofs, and adaptive reuse of old industrial buildings in Chicago. Geiger explains how these innovative ventures help to reduce urban heat island effect, provide locally grown vegetables, capture rainwater, and spawn fish farms and breweries in abandoned neighborhoods. Learn why these efforts matter and what individuals can do to live green. Geiger is a landscape historian and educator. Please register. Geneva Public Library is offering programs on the environment, food, nutrition, and more during March. The Library's "Conscious Choices" series includes a panel discussion by the Geneva Green Market and a special event at the Northern Illinois Food Bank. For more information contact Kimberly at (630) 232-4806 or view the calendar at http://www.gpld.org/ Program and Events. Batavia High School's English II Class created a discussion guide for The Good Food Revolution. One Book, One Batavia is an annual community-wide reading program presented by the Batavia Public Library in cooperation with Batavia High School and co-sponsored by the Friends of the Batavia Public Library.